This limited edition Voodoo Knife Block is worth it’s weight in gold! 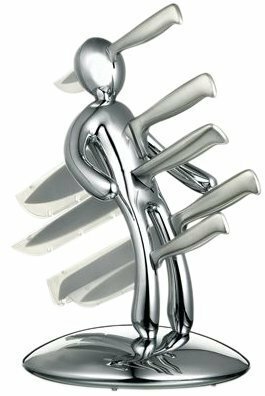 This knife man is as shiny and sharp as the knives that he holds! The gold voodoo knife holder is an extremely limited edition and is currently available from Amazon. The blades of the knife are forged from tough vanadium/molybdenum stainless steel. This steel alloy retains an edge; resist wear and rusting for longer than standard steel kitchen knives. Magnets hold the knives in place and protective plastic sleeves protect the blades. The item is designedin Europe and manufactured in Taiwan by CSB Commodities. Voodoo Knife block: 255mm (Wide) x 385mm (High). Use mild, soapy water to hand wash the knives and holder. The knives can be machine washed but it is never recommended to place quality kitchen knives into a dishwasher because they will require more frequent sharpening or honing. Use a sharpening stone or steel as often as is required. 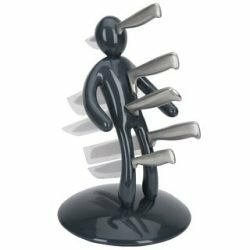 We really want to hear your stories about the Voodoo Knife Block so after you have received your knife man then try a bit of voodoo trickery with it to test out its real powers. The product is sold as “The-Ex” in America because of its ability to cast voodoo spells upon ex-lovers! We hope that you will never be in a situation where you need to carry out such dastardly acts – indeed we hope you never split up from you nearest and dearest…. but just in case you do then please come back here to write a review of the cathartic experience of using your voodoo knife holder as a revenge tool.